How much should I save for retirement? Should I save for retirement or increase my giving? As someone who has worked with money for over 40 years, I have found these to be very trying and difficult questions – especially for the Christian. With the center of our thought resting on the glory of God and being faithful disciples, it can be confusing. Save for Retirement or Increase Giving? If we look at this from an earthly perspective, we can be overwhelmed with the dangers to a successful retirement. Longer life expectancies, medical costs, inflation, unpredictable investment returns, long-term care possibilities, and many other variables, can lead us to think that we can never save enough, right? If we look at this from a Jesus-is-everything-to-me perspective, however, the answer might be very different. For the Christian, life is not just about doing what I want to do. It’s not about societal norms or the desire to not work or to have a luxurious retirement. It’s about living for Jesus 24×7. And Jesus is all about saving the lost and being our real treasure. So, let’s look at 4 overarching issues as we think about this. Everything we’ve been entrusted with is due to God’s design for us. And what we’ve been entrusted with is to be used to reflect God’s glory. This is the concept of stewardship. Everything we are and have – body, mind, money, time, talent, children, etc. – are all to be managed so as to show the value of King Jesus. For most people, retirement means generating at least some of their income from savings. And, the money we save for our retirement is God’s money. So, we must be careful to make sure our resources are being used rightly. We shouldn’t make retirement decisions without God’s perspective being the first priority. It’s easy to think that retirement is about a life of ease or simply not working. But that shouldn’t be our focus. Our purpose doesn’t change once we reach age 65 or 70, or choose to leave employment. From beginning to end, the Christian life is about becoming more like Jesus and living for him. 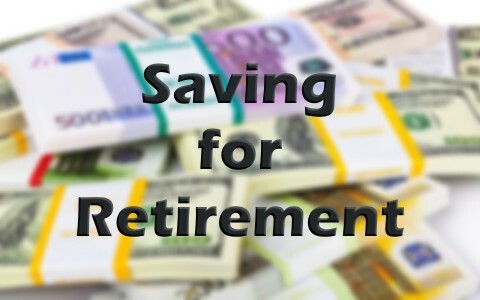 The cost of one’s personal standard of living is another key factor in saving for retirement. The more you spend in retirement, the more you will need to accumulate. The less you spend, the less you’ll need to accumulate. Living a simplified lifestyle can help us focus on our Kingdom work and reduce our need for a large accumulation. In other words, living for Jesus means our lives are focused on the Kingdom in everything. Raising children, buying cars or a house, thinking about college, our standard of living, and certainly retirement, should be considered carefully. We don’t want to move our focus away from the goal. Question – Are missionaries wrong for giving their lives to spreading the gospel and saving little for retirement? If you say, “No!”, the following question must be asked. Aren’t we all called to live lives of faith and give everything we are to God’s mission for us? Jesus spoke very difficult words to those who would follow Him. This doesn’t mean we shouldn’t save for retirement. But this does mean that we live for the Kingdom and not for our wealth. In many ways walking by faith means that we will continue to believe this and then we act accordingly. Thinking about and planning for retirement is important. We should be able to pay our way when we can’t work. For the Christian, however, retiring to a cushy lifestyle should not be the focus. We should continue to live for Jesus and work to advance his Kingdom. Live small, give much, trust God. Read more about stewardship: What Does the Bible Teach About Stewardship? Next post: Why Do Some Christians Seem So Judgmental?